Chandigarh  is India's first planned city, quite distinct from the rest of the country and considerably better organized. It is the capital of both Haryana and Punjab, but the city itself is not part of either state, being a union territory, i.e. administered directly by the central government. The most striking thing about the city is the expanse of resplendent blue sky with the mountains in the backdrop. When you are approaching the city, you would see the jagged skyline of the Shivalik Hills looming large over the city and the faint image of an old temple dedicated to Goddess Chandi (15 km from Chandigarh) from which the city got its name. Chandigarh may appear oddly familiar to Western visitors and idiosyncratic to the rest of India. Because of this, Chandigarh is a good place to visit if you need a break from the constant flow of which is often said to assault the senses, and can be overwhelming to foreign travelers. Chandigarh is also a very secure city. With the lowest crime rates in the country, you can feel safe at any hour. The political position of Chandigarh is quite ambiguous for anybody not knowing the city well. It is the capital to two northern Indian states Punjab and Haryana besides being a union territory in itself. The birth of this modern, youngest and vibrant city was an act of anguish and drama that took place at the time of partition of India and Pakistan. Lahore, the historical capital of Punjab was ceded to Pakistan and Chandigarh was conceived to be a symbol of India's freedom. The government of the state decided to build a new city at the foot of the Shivalik hills. Architects Albert Mayer and Mathew Novicki drew the initial plans in New York. When the latter died in an air crash in 1950, the work was entrusted to renowned Swiss born, French architect Edouard 'Le Corbusier' Jeanneret who created Chandigarh as a city of "Sun, Space and Verdure" to fulfill basic functions of working, living, and care of body and spirit. Today, the city is home to more than 900 000 people living in harmonious conditions that are considered to be the best in the country. One can see architectural genius in the neat geometrical design of residential quarters, reinforced concrete structures and self-contained area layouts. Chandigarh is divided into 47 self-contained sectors. Each sector of the city is designed with its own shops, academic, and health care buildings, and places of worship, open spaces, greenery and the residential areas. Chandigarh is one of the best planned cities of India. Roads are pretty wide and spacious. It hasnt grown in a haphazard way as some of other Indian cities have. The city is divided into four major work areas. In the north, the capital complex, consisting of the Secretariat, Legislative Assembly and High Court, with the hills as a background dominating the city. Punjab and Haryana High Court at Chandigarh (also known simply as Chandigarh High Court) has original as well as appellate and supervisory jurisdiction over all matters pertaining to Chandigarh, Punjab and Haryana. Sector 17, which is the city and district centre, houses the administrative and state government offices, as well as shopping malls, banks and other offices. The west contains the university, and institutions of engineering, architecture, Asian studies and medicine. Finally, the east zone, which is the industrial area of the city. Chandigarh is one of the few planned cities in India, the others being Gandhinagar in Gujarat and Bhubaneswar in Orissa. In 1966, the Hindi-speaking areas were split from the Punjabi speaking areas of the state to form a new state of Haryana. Chandigarh, however, continued to be the capital of both Punjab and Haryana. In a strange anomaly, the city itself was not made part of either state to avoid any dispute but instead brought under direct rule by the Central Government as a union territory. It was agreed that in 1986, the city would pass to Punjab, but this has been indefinitely delayed because Haryana insists on getting some territory in return, and the two states have not been able to agree on it. Alliance Air , Air India, IndiGo , SpiceJet , GoAir , Vistara  and Air Asia  connect to the city. The following cities are connected with direct flights to the city: Bangalore, Bangkok–Suvarnabhumi, Delhi, Dubai, Hyderabad, Jaipur, Kullu, Lucknow, Mumbai, Pune, Sharjah, Srinagar. Direct flights from the following cities are scheduled to commence in the near future: Indore (begins 1 August 2018), Kolkata (begins 3 September 2018) and Pune (begins 26 March 2018). Tickets cost between Rs 4,000 and Rs 6,000 (from Delhi, including taxes) for most of the airlines. There is frequent service to and from New Delhi. The popular trains connecting New Delhi include Kalka (Chandigarh) Shatabdi Express (twice daily) and the economical Chandigarh Jan Shatabdi Express (Una (H.P) to Delhi). Shatabdi Express is quite popular and it is better to have an advanced reservation at least 2-3 days prior to the journey. Chandigarh Lucknow Express (daily) to Lucknow. Chandigarh-Jaipur Garib Rath to Jaipur. While it is good to take the cabs for travel on this route in summers, it should be avoided in winters due to heavy fog. Dec -Feb are winter months in India. Chandigarh, being situated in laps of mountains, faces heavy fog in night and early morning. Sometimes the visibility on roads get reduced to less than six feet in such times. Delhi is extensively connected with bus service every 15 min offered by Chandigarh Transport Undertaking, Haryana Roadways, Punjab Roadways and Himachal Roadways. Volvo A/C buses are also run on Chandigarh-Delhi section and offer connection to the Airport and towns like Gurgaon. The fares of Volvo buses are usually comparable with the Shatabdi Express. The Haryana State Transport service allows you to book the tickets to Delhi, IGI Airport and Gurgaon online here.. The Chandigarh Transport Undertaking (CTU) provides local bus Transport service in Chandigarh and satellite towns of Panchkula and Mohali. There are two local bus terminals at Sector 17 and at Sector 43. The bus service is frequent and efficient and runs from 6:00AM to 10:00PM. It is very economical with a single point to point fare of Rs. 10 regardless of the distance. The map of Chandigarh showing all the bus routes is printed on the back of each ticket. In the New Grid Transport System, 45 routes are being plied in Chandigarh. The travel is generally hassle-free, though there might be rush on some particular routes during morning and evening peak hours. Recently, mini air-conditioned buses have been deployed on some vital routes (connecting location such as PGI, ISBT -17,43, Railway Station, IT park and others). The fare for these is Rs. 10/ for a single trip. The buses with corresponding routes can be found here. The Chandigarh tourism also runs a special Hop On Hop off double-decker bus which takes you around for a tour of all the main spots in the city including Sukna Lake, Punjab University, and the Secretariat. Having bought one ticket, a person can board or disembark as many times in a day as he wishes. This provides flexibility to see the places of interest and spend as much time as he wishes at a particular spot of choice. It starts its journey from Hotel Shivalikview in Sector 17 near the Bus Terminal. For Booking contact : Citco Tours & Travel Wing, ISBT, Sector 17, Tel: 2703839. Uber and Ola operate in city and it is very easy to get an uber. There are many private local taxi services in the city like Guru Taxi Service Chandigarh, Amy Cab Chandigarh, Gagan Taxi Service. The private taxi operators can be located at Taxi stands in Commercial market of every sector. UT administration has started a fully air conditioned cab service. The cabs are available at the door step on giving a call. The cabs are stationed at important places including Railway Station and Airport. The cabs are fully air-conditioned and extremely comfortable. They serve Chandigarh and satellite towns of Panchkula and Mohali. All the taxis are brand new, air conditioned/air heated and driven by the uniformed drivers. Taxis are also have a complaint book and any passenger can lodge a complaint with State Transport Authority if services provided to him are not found up to the mark. The [Delhi to Chandigarh Taxi] are continuously monitored through GPRS technology whereby their locations are monitored by their respective control rooms. There are no charges for first KM except for the meter down charges. Rate Rs. 15/- for the first kilometer and Rs. 15/- for the subsequent kilometers. Chandigarh Union Territory is the first city in the country to have Radio Auto service on the lines of successful working of the Radio Taxi service. These autos cost Rs. 25/- for first two kms and Rs. 6 for subsequent km. The service named as "Jugnoo" is available round the clock. Available on call at +91-9023-121-121 or through the "Jugnoo - autos on demand" app on android and iOS stores. On the whole, Auto Rickshaw are not quite popular in the city although are easily available at Bus Terminals, Railway Station, and Auto Stands in the commercial market of every sector. It is very unlikely that they would operate with a meter so negotiate the price before engaging one. Cycle rickshaws are three-wheeled pedal powered rickshaws with seats in the back to seat passengers and a driver in the front. They are good for short distances, or places which are too far to walk but too short for taking a bus/taxi/auto rickshaw. Cycle rickshaws can be easily spotted in all parts of the city. You should negotiate the price before boarding one of these. Ask the locals to help if you doubt the charges demanded. Chandigarh byCycle offers guided bicycle tours of the city in English and French. The tours are 2-3 hours long and cover the must-see sights on geared and well-maintained bicycles. The local perspective of the guides offers a more personal account of Chandigarh. The tours steer clear of traffic by using dedicated cycling lanes. Rock Garden  designed by Nek Chand. One day 36 years ago, Nek Chand, a humble transport official, began to clear a little patch of jungle to make himself a small garden area. He set stones around the little clearing and before long had sculpted a few figures recycled from materials he found at hand. Gradually Nek Chand's creation developed and grew; before long it covered several acres and comprised of hundreds of sculptures set in a series of interlinking courtyards. After his normal working day Chand worked at night, in total secrecy for fear of being discovered. When they did discover the garden, local government officials were thrown into turmoil. The creation was completely illegal - a development in a forbidden area. However, rather than demolishing the garden, they decided to give Nek Chand a salary so that he could concentrate full-time on his work, plus a workforce of fifty labourers. The park is open daily from April to September between 9 a.m. to 1 p.m. and 3 to 7 p.m. Between October and March, it is open from 9 a.m. to 1 p.m. and 2 to 6 p.m. The Capitol Most of the capitol complex is fenced off due to tight security, the open hand is accessible and from there you can see the main buildings, albeit in the distance. If you want a closer look at the Capitol, you need permission from the Tourist Bureau, in the ‘Deluxe Administration building’ in Sector 9. Please note the capitol and bureau are only open on M-F. The tourist bureau is not well signed, you’ll need to ask. It’s in the single story building out the back. Bring your passport and prepare for the beginning of the most amazing experience in Indian bureaucracy. One can also get the permit from the Tourist Reception Centre in Sector 17 Plaza. All in all I spent three hours in total of which 50 minutes was spent looking at architecture. The tourist bureau gives you three letters giving you permission to visit the three main buildings of the Capitol complex, The Secretariat, the High Court and the Assembly. The Chandigarh Museum, which is just next door, provides an interesting aspect on how Chandigarh was founded. It begins with the principles on which Chandigrh was built, selection of the Architects, the design for the people etc. The correspondence between the Punjabi officials overseeing the construction of the city, and the Federal Government in Delhi is fascinating, and well worth taking a few minutes to read. Chandigarh, with the highest income per capita in India, is home to some of India's biggest brands. Hotspots for higher-end shopping include markets in Sector 17, Sector 22, Sector 35, and Manimajra. along with the Elante shopping mall. However, shopping is typically more expensive in Chandigarh than it is in other cities, including big cities such as Delhi. Chandigarh byCycle offers guided bicycle tours of the city in English and French. The tours are 2-3 hours long and cover the must-see sights on geared and well-maintained bicycles. The local perspective of the guides offer a more personal account of Chandigarh. The tours steer clear of traffic by using dedicated cycling lanes. Enjoy the planned city, with tree-lined roads, large beautiful roundabouts, several gardens and on the top it - a great set of people. Visit the Sukhna Lake in the evening or early morning for an enriching pleasant experience. Visit Nek Chand's Rock Garden to take a walk through a magical kingdom made entirely out of recycled materials. Enjoy a round of boating on Sukhna Lake's enigmatic waters. Shikaras are also available. Set aside some time to visit the nearby hill stations of Kasauli, Solan or Shimla. Visit Kalagram on Manimajra-Chandigarh road. It has exhibition of various handicrafts and decorations from various parts of the country. It also houses the innovative and famous "Condom Bar", whose theme is centered on condoms. The city has several cinema halls with the classical single screen format. Catch a movie at any one of the halls, all of which are air conditioned and well maintained. The city has more than a dozen malls with 4 or 5 screen multiplexes. Some of these are Fun Republic(Fun Cinemas) in Manimajra, DLF DT Cinema in IT Park, Green House Entertainment(Big Cinemas) and Centra Mall(PVR Cinema) in Phase 1, Industrial Area. Big Cinemas at Downtown Mall, Zirakpur on Chandigarh-Punjab border and Fame Cinemas at Shalimar Mega mall,(PVR: Elante Mall )in Phase 1 Industrial Area ,(Piccadily Square: Chandigarh) sector 34 are new upcoming entertainment malls also easily accessible in the city. Many others malls and multiplexes are coming up in Chandigarh and around soon. The city has a rich theatre culture with regular performances by societies and groups from all over India. Tagore Theatre in Sector 18 plays host to most of the performances. One can view these street plays in PLAZA CARNIVAL situated in sector 17 Main Market, which can be viewed by everyone. FunCity -20 Km (12 mi) from Chandigarh on the Panchkula - Barwalla Nadha Sahib Gurudwara Highway near Ramgarh . Thunderzone - A 30 min drive from Chandigarh, located in Landran, Mohali. The city has an expansive presence of leading national dailies which roll out their City-based editions. Among these are The Times of India, Hindustan Times, The Tribune, The Indian Express, Amar Ujala (Hindi), and Dainik Bhaskar (Hindi). The Tribune, one of the oldest print newspapers in circulation, has its headquarters in Chandigarh and is popular throughout the region. Chandigarh has evolved into an education hub for competitive exams. Thousands of students from nearby states of Punjab, Haryana, and Himachal Pradesh attend coaching in Chandigarh. The city has delivered excellent results in recent years in all spheres especially the IIT-JEE, CAT, CBSE-PMT and the Civil services. PGIMER - Post Graduate Institute of Medical Education and Research. It is one of the premier medical research institutes of the country and serves a wide array of patients from the neighbouring states. Punjab University - With a beautiful campus, Punjab University is one of the most sought after universities by students from the northern region. PEC University of Technology (previously Punjab Engineering College) - The alma mater of NASA astronaut Kalpana Chawla, the institute continues to climb up national rankings and has been designated as a deemed university. C.C.E.T.- Chandigarh College of Engineering and Technology-Formerly known as the polytechnic, had been upgraded to include the bachelors degree in engineering, in 2002. The college has the reputation of being the only Engineering college affiliated with Punjab University AND run by Chandigarh Administration. As of now it provides B.E. in the field of Computer Science & Technology, Electronics & communication, Mechanical and Civil Engineering. UIET-University Institute of Engineering and Technology-This is a prestigious engineering institute started by Punjab University in 2002 to provide education in engineering and its associated fields to the growing number of students from around the city. Government College of Art -This Institution is a platform where the method of practice of Art can be learnt by the upcoming artists to bring out their creative talents. It is the only nucleus institution of its kind in Punjab, Haryana, Himachal Pradesh, Jammu and Kashmir. Affiliated with Punjab University. Chandigarh College Of Architecture-What is not so well known is the fact that the 20th century's greatest architect also succeeded in getting Chandigarh College of Architecture (CCA) established as an integral part of the great Chandigarh Experiment. Affiliated with Punjab University. Institute of Microbial Technology (IMTECH) - It is a constituent establishment of CSIR (Council of Scientific and Industrial Research, Govt. of India) doing research in microbial biotechnology. It offers doctorate degree in different fields of biotechnology such as protein science and engineering, fermentation technology, immunology and cell biology, bioinformatics, genetics. It houses one of the world's best bioinformatics research center. Opportunity is available to work in the growing IT and BPO industry in the city. Newly built IT park had been set up in the city which has proved to be a magnet for potential job seekers in this field. Satellite town of Mohali is also home to several IT majors like Infosys, Altruist Technologies, SoftProdigy, Webart Softech , Dell Inc. and more to name. Most of the population here is employed in Government Services with administrative headquarters of all departments of the government of Punjab and Haryana being situated in Chandigarh. There are plenty of Shopping Avenues in Chandigarh. Chandigarh is home to all leading brands and retail store chains. Sector 17 is a fully commercial sector that houses all the major brands and shops that cater to wide array of taste and pocket. Other popular shopping places are Sector 22 (especially rehri market), Sector 35, and Manimajra. If you want to bargain hard for usual stuff, try the Azad Hind Market in Sector 22 but note that it is closed on Monday. You can buy souvenirs in the form of coffee mugs, shirts, etc. at Sukhna Lake. You can relish all type of cuisines from local Punjabi flavors to Continental cuisine. Hot Millions  - Sector 17, Sector 35 and also in Mohali, Panchkula. Nik Baker's  - Sector 35, Sector 9. Manor restaurant - sector 26, for an authentic indian dinner and sizzlers. Domino's Pizza - Sector 17, Sector 34. McDonalds - (Fun Republic) Manimajra, Sector 35. KFC - Sector 8, Sector 35. Subway - Sector 17 and Sector 35. Tehal Singh's - Sector 22. One of the best places to try the famous Butter Chicken of Punjab. Chawla's - There is a whole Chain of Chawla's, the better ones being in Sector 8 and Sector 22. Sagar Rathna- South Indian Vegetarian Food chain, Sector 17. Apart from these, a variety of restaurants can be found in the Sector 35 market, ranging from traditional Indian sweetshops (Gopal's) to burger joints like Mcdonald's to formal dine-in joints. Black Lotus at the Taj Chandigarh, for exceptional Chinese fare, cooked by a Beijing imported chef. Hotel Mountview and Shivalikview also offer specialised dining rooms and bars. Orchid Lounge at Sector 34, for excellent Thai cuisine. Nando's Chicken at Sector 35 is a recent addition. Hometel Hotel at Industrial Area Phase 1 is part of Sarovar Chain of Hotels. For a true Indian Coffee experience go to Indian Coffee House in Sector 17. Barista, Cafe Coffee Day and Costa Coffee are also popular Indian chain of coffee shops that can be found in Chandigarh at various places. Chandigarh possesses a posh nightlife scene which does full justice to it's status as a Metropolitan city and a focal point for Punjabi culture. One can enjoy a good drink with music at various pubs/bars with combined restaurants at Sectors 9, 35, 26, and Sector 17, apart from others. The bars remain open till 12 or 1 in the night. Lodgings in central Chandigarh are notoriouly overpriced, and the expense is generally not matched by quality improvements. Don't be surprised to be asked over 1000 rupees/night for a dingy room without windows in sector 22. There is a number of budget housing options (of price and quality comparable to typical Indian cities) located in the large market area of sector 45. The area itself is considerably more "Indian" than the central districts, with its narrow winding streets and a strong community feel. As of February 2013, you should aim at 500 rupees/night in this area, after some haggling, and there are many hotels to choose from. STD code for Chandigarh is 0172. When calling from overseas, dial +91 172 XXXXXXX. The same STD code is shared by Panchkula and Mohali. If you have a non-working phone number with only 6 digits, try to add a "2" in front of it. Chandigarh has one of the highest cellular density in India. The city is served by all major cellular operators : Airtel, Vodafone, Reliance, BSNL, Tata Indicom, Docomo, Virgin, Spice, and Connect. The cellular connection provided covers the cellular network of state of Punjab and city limits of Panchkula district in Haryana. If you do not have an Indian phone number, it is strongly recommended that you get a pre-paid calling card if you plan on using your phone frequently. Because of new government regulations, you need a photocopy of your passport (visa and the ID pages), a colour photo, and proof of local address (in Chandigarh) when buying a pre-paid card. Pre-paid cards are sold in a few of the shops that sell mobile equipment. PCOs are a good option. You will find them almost every 100 m. These are public pay-phones (post-pay) and there will be a person on the shop to take the payments. Check your bill generated (from the billing machine) and make the payment accordingly. Payments are always in Indian rupees. Internet is cheaply and easily accessible via various cyber cafes operating in every corner of the city with rates ranging from Rs 15-Rs 30 per hour. Reliance Web World: Operates through various centres in Sector 9, Sector 35, Sector 46, etc. Sify Centres: Spread throughout the city. Chandigarh is a safe city. With the lowest crime rates in the country, you can feel safe at any hour. Police assistance can be found at the nearest police station or at the patrolling booths in every sector. You can call following numbers for respective help : 100 (Police), 101 (Fire), 102 (Ambulance), 1073 (Traffic Police Helpline). If you are calling from a mobile phone, just add the STD code such as 0172 in front of the emergency numbers. This is true in any other Indian city. India is often said to assault the senses, and can be overwhelming to travelers. Chandigarh may appear oddly familiar to Western visitors and idiosyncratic to the rest of India. Because of this, Chandigarh is a good place to visit if you need a break from the constant flow of India. Apollo Hospitals Enterprise Ltd., Sector 34-A. Silver Oaks Hospital, Phase IX, Mohali. Pharmacies are dime a dozen and you should not have any problem locating one, though Sector 16-C is considered the "pharmacy district" and offers a variety of shops to find your medication. You do not need any prescription for Modern Medicine Over the Counter drugs and ayurvedic medicine (proprietary and traditional), which are available for most common ailments like fever, headache, travellers' ailments, general infection, etc., but you will need prescription for other medicines, which are categorized as Schedule H drugs. You can locate 24-hour pharmacies at PGI and G.M.C.H., Sector 32. General amenities for daily living like grocery shopping, laundry etc. can be availed all in one place in every sector's market complex. Each sector is self sufficient in that regard and serves almost all the needs of its residents. There is a strict enforcement of traffic rules in Chandigarh. Wearing helmets (for male riders ISI Marked), driving under the speed limits, driving without drinking and using seat belts are compulsory. Violators pay heavy penalties. No exceptions to these rules are made to cars from outside the state. Sarson blooms at Prakriti Farms, a rural & traditional Punjabi farm-stay. Motorbike expeditions. Many bikers clubs organise motorbiking and adventure activities. Shimla, just 110 km (70 mi) from Chandigarh by road. Kasauli, only 90 min drive from Chandigarh can also be visited. 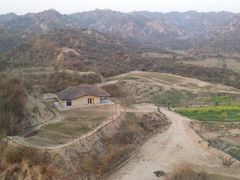 It is a hill station not very far from the city. If one is lucky, in clear weather it offers a staggering view of Chandigarh from the Himalayan Foothills. Note that foreign visitors will need to present a valid passport to gain entrance. Other Himachal hill stations such as Kullu and Manali, a gateway city to Himachal Pradesh. A trip by road to Kullu takes about 12 h by bus or 6-7 hours by taxi. One can visit Pinjore Gardens that are within a range of 15-20 km (9-12 mi) from Chandigarh on the way to Shimla. This page was last edited on 21 April 2019, at 01:27.